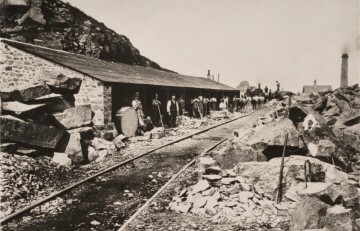 Stone Masons’ huts at Mountsorrel Quarry circa 1890s. The project has been shortlisted for a funding award of £5000 to help volunteers construct the replica Stone Mason’s huts at the new heritage centre site. Around 100 years ago the old Mountsorrel quarry had hundreds of these huts around the outside of the quarry. A stone mason worked in each hut with his hammer and chisel all day long, working the stone to create road side kerbs, setts (road cobbles) and dressed building stone. Our aim is to recreate three of these huts in the historic quarry recreation area alongside the new heritage centre. Volunteers intend to undertake all of the building work with the grant covering material costs. On select days each year it is hoped to bring in a stone mason to give demonstrations to visitors of how the granite would have been worked at Mountsorrel all those years ago. The grant award will be decided based on an online public vote. Please give us your support and spare a couple of minutes to vote at the following link. If you wish to check on progress then visit https://foundation.onefamily.com/community-awards/nominated-projects/ and filter for project size “£5000” and sort by “Most Votes”. To stand a chance of winning the £5000 award we must be in the top 15 so be sure to make your vote count.